This Heritage Cure Oyster Bacon is simply delicious. Oyster Bacon is the centre cut between the Ham & the Loin. There is a certain sweetness as it is cured and 'kissed' with smoke over beechwood chips. This develops the taste and the flavour. Having received a Great Taste Gold Star Award, here's what the judges had to say. 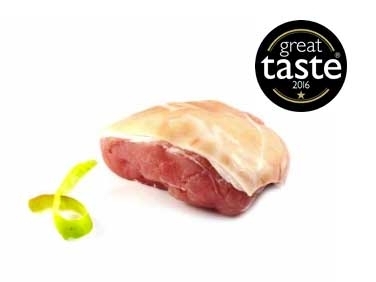 "A very inviting piece of bacon, with a great layer of fat, extensive caramelisation, and lots of visible moisture in the meat. The texture of the meat was very good, with a lovely level of moisture from the fat but a good density from the muscle. The flavour of the fat was good, with some nutty sweetness, and a balanced smokiness from the cure. A good cut of bacon with a superb crunchy crackling. Sweet bacon with good juicy succulence."